The inaugural Veterans Florida Entrepreneurship Program has given numerous veterans the knowledge and support they need to make their dream of launching their own business a reality. He may have been working on his ice creams for some time, but realization of his business concept took a huge leap forward this past spring when he completed the inaugural Veterans Florida Entrepreneurship Program at the University of West Florida (UWF) in Pensacola, FL—a free three-phase program that was offered at five different state universities with the involvement of local Florida Small Development Centers (SBDC) and the goal of fueling both veteran-owned enterprises and the Florida economy. The program was created and sponsored by Veterans Florida. Bradley is not alone in having reached critical business launch milestones. Over 400 active duty military men and women and veterans were admitted to the pilot Entrepreneurship Program across the five participating universities, and approximately one third of them completed the online and classroom phases. Bob Buehn, Entrepreneurship Training Program Manager at the University of North Florida in Jacksonville, says that both men and women attended and they represented diverse ages. He was wowed by their entrepreneurial concepts and dedication, as well as the expertise of the all-volunteer professors and business experts who provided instruction. Bradley is of a similar mind. Although he valued the online portion enormously (the insights provided by two text books, videos and a web forum where the students and instructors could provide feedback to one another), he especially appreciated the classroom training. “I learned about various tools and resources,” he says. “One was for conducting demographic research and that was pure gold for me.” The classroom sessions also covered effective business pitches, funding sources, presentations to prospective funders, marketing and branding. “We got to mingle with instructors, mentors, business experts and fellow students, many of whom had already accomplished a lot—and they all provided smart ideas,” says Bradley. “Those resources will prevent me from going out there and just winging it. I got the tools I need to build my business plan, identify my target market and structure my business so that it’s profitable. I would recommend this program and the Florida SBDCs to anybody who wants to go into their own business. As long as it’s not ice cream, of course,” he adds, smiling. 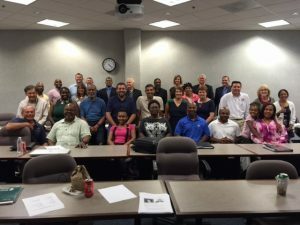 Learn more about the next Veterans Florida Entrepreneurship Program and how to enroll.